Amazing show! So many interesting "old" Firearms for sale, trade and/or on display!!! Steve Ruger and I set up his and John F's awesome 50th Anniversary of the Super Blackhawk display. 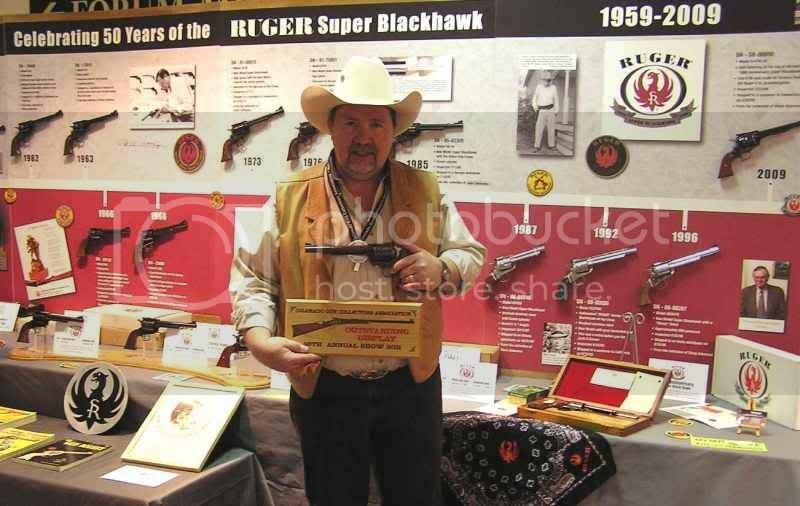 The Display features a "Time Line" theme and includes significant examples of Ruger's Super Blackhawk from the Prototype stage through the 50th Anniversary Super produced in 2009. The public was very receptive to the overall appearance and we received many, many compliments. Why, the Judges even rewarded the display a 3rd Place in the Outstanding Display category!! PS This Forum's software won't permit me to post an image of the "whole display"...... sorry. This is an amazing quality Show. Not many Rugers, or modern firearms, but the Colts, Winchesters, Smiths, Sharps, Kentucky rifles, etc is just overwhelming. The displays are best you will ever see. Don and I judged 46 of them. good thing there were 2 other Judges or some may have thought us biased towards Rugers! Don was sitting there in the big chair and one show Attendee came by and asked him if he was John Amber!! Was some similarity, except I guess Mr. amber has been gone 25 years! Yes, that image is almost "spooky"! Anyone recognize the "pattern" or have an idea who the engraver was?